The Costantino Recreation Center offers several options for fitness, strength training, and other kinds of recreation. Equipment and most spaces are first-come, first-served and are available whenever the CRC is open. Peak hours during the school year are 5–8 pm on weekdays. Develop your own workout system with our fitness facilities on the second and third floor of the recreation center. 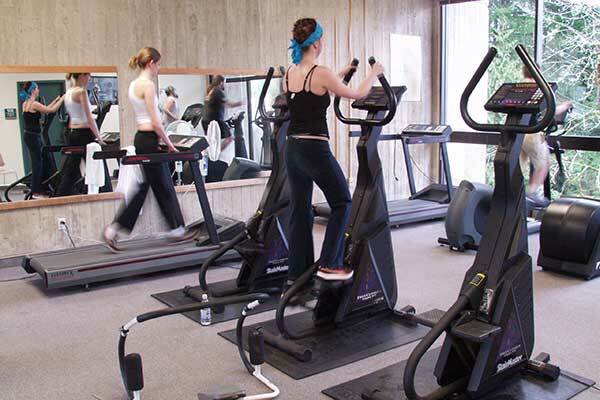 Cardio room with treadmills, elliptical, and stationary bicycles. GeoFit Room for cross training: includes battle ropes for upper body strength, pull up rig, and pegboard. Racquetball courts: both a great wood court (goggles required) and a nice place for stretching and floor work. The GeoFit Room, weight room, and one of the racquetball courts are all ADA accessible. Climbing shoes are required. Street shoes should be kept out of the climbing gym. You can stash them in a locker in the hallway. 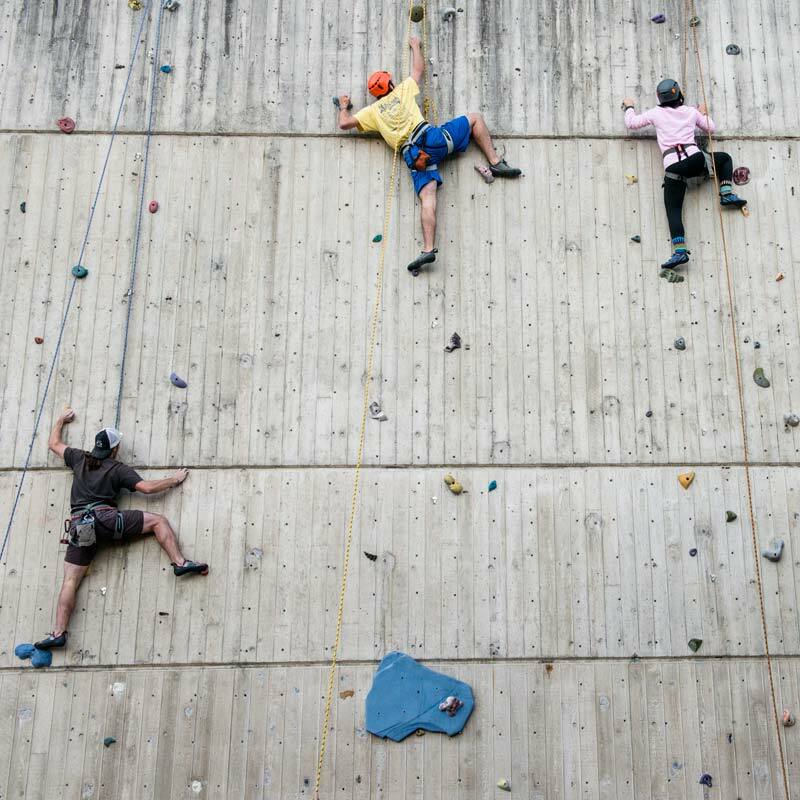 This gym offers bouldering only—routes are low to the ground and don’t require a rope, harness, or carabiners. The outdoor climbing wall is currently only available by reservation or through special events sponsored by The Outdoor Program. Yoga is a great way to relax, stretch, and work your body. The main gymnasium often hosts open sport times from 7:30–9 pm. Hosting three Intercollegiate sports teams, the gym can be busy during the fall and winter seasons. Otherwise, when the gym is open, feel free to come in and play basketball, try breakdancing tricks, or just hang out. It's an open space for all our members. See http://schedule.evergreen.edu/scheduling/calendar for reserved times or find out how to reserve the gymnasium. The game lounge near the front desk is another open space. We've got pool tables, foosball, and air hockey, plus cable TV for entertainment while you play with friends. The multipurpose rooms and classroom are only available by reservation. Share the spaces thoughtfully and help keep them clean. Wear appropriate attire, including shirt and closed toe shoes. Backpacks and other extra gear must be stored in a locker, either in the second floor hall or the locker rooms. You’ll need your own lock. Bring water, but no other food or drink is allowed. Be supportive of other users. Rudeness, bullying, and other antisocial behavior is not welcome! See the full list of CRC Rules for more details.